Chinese location-based mobile messaging app Momo took the wraps off the Android version of ThePuzzle, the first online game of the company, with South Korean gaming company Com2uS. The iOS version will be released very soon (report in Chinese). ThePuzzle is an elimination game integrating several features of Momo. The cartoon image of this game is adopted from one of Momo’s emoticons. In addition to sharing scores to friends, players also can see their rankings among users nearby or in the same cities, and add these strangers to their friend lists. Yang Ye, representative of Momo game center, disclosed that the company will introduce more games in the future. 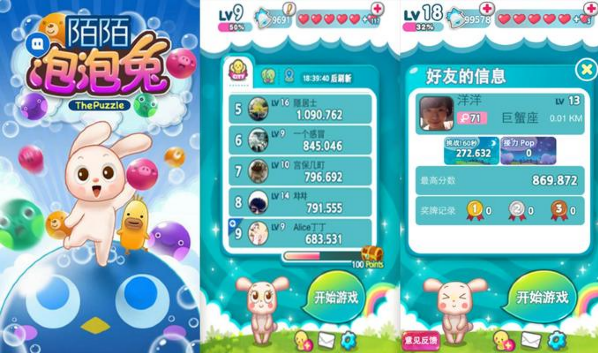 The online games released by WeChat witnessed instant success thanks to their simple, but highly competitive gameplay. With the release of ThePuzzle, Momo jumped on the mobile game bandwagon, hoping to shake off the image of flirting app and gain attraction to wider range of users. In this July, Momo announced 50 million registered users from 131 countries, with more than 700,000 chat groups.